With an objective to fulfil the demands of our clients, we are engaged in manufacturing and supplying a wide range of Jewellery Bags. Backed by professionals, we have come up as the reputed organization putting across beautiful series of Jewelry Paper Bags. Backed by a team of smart and talented team members, we are affianced in providing a beautiful collection of Jute Jewelry Bags. Bangle Bags are ethnic wedding gifts and is handy to hold mobile, lipbalm and such necessities. 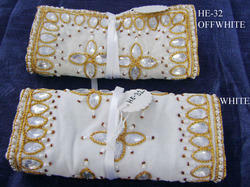 We are the manufacturer and exporter of Zari Pouches. The Velvet Pouches that we present with has been made using materials that are outstanding in terms of quality and style. Our products are well made keeping in mind the overall functional purpose of the product. We adhere to all the norms and offer client friendly products. The price offered by us are very affordable and nominal. Owing to the wide experience in this domain, we are instrumental in offering Jewellery Suede Bag Grey to our clients. With immense knowledge and expertise in this domain, we are involved in offering a quality approved range of Jewelry Bags. The offered range is well tested on various quality parameters before introducing it to the clients. Our clients can avail this offered range at very competitive rates.